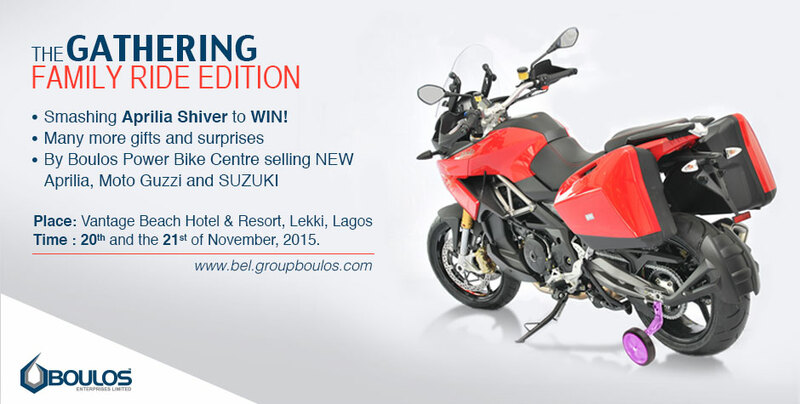 SCAN | Superbiker Clubs Association of Nigeria – Be At ‘The Gathering’ and An Aprilia Shiver Could Be Yours Courtesy of Boulos Enterprises Limited!!! Be At ‘The Gathering’ and An Aprilia Shiver Could Be Yours Courtesy of Boulos Enterprises Limited!!! Be At 'The Gathering' and An Aprilia Shiver Could Be Yours Courtesy of Boulos Enterprises Limited!!! The Gathering is our family-centric event designed by bikers for you. Fill the form below now and invite your friends and family to do so too. If you would like to book accommodation through this platform, kindly indicate below. Price per room for the 2 nights (Friday & Saturday) is at a heavily discounted sum of N26,000. All rooms are the same price irrespective of size, but note that ROOMS WILL BE RESERVED ON A FIRST-COME-FIRST-SERVE BASIS, and availability is limited. Booking closes on the 16th of November, while registration for The Gathering will remain open, but you would have to sort out your accommodation independently. This service is provided by “The Gathering” sponsor, RIDE EASY LIMITED. By clicking the REGISTER FOR THE GATHERING button, I agree to release from indemnity and forever discharge the Superbike Clubs Association of Nigeria, Vantage Hotel, Citilodge Hotel, Newcastle Hotel and the sponsor of this service, RIDE EASY LIMITED from any and all actions, causes of action, claims and demand for damages, loss or injury, arising in any manner, which may be sustained by me in this or subsequently organized activities, events or meetings; including but not limited to claims under any legislation and all damages, loss and injury which may arise in the future, and all subsequent effects and consequences, and for the same consideration. I further agree not to make any claim or take any proceedings against any other person or entity who might claim contribution or indemnity from Superbike Clubs Association of Nigeria, Vantage Hotel, Citilodge Hotel, Newcastle Hotel and/or RIDE EASY LIMITED or its agents. I further allow the Superbike Clubs Association of Nigeria and/or its agents to contact me in any future events and/or promotions while giving my permission to use images and photos of me for adverts and similar material.